Most articles on Senegalese music identify Youssou N’Dour as the man who put the mbalax rhythm on the map, who created an internationally identifiable Senegalese musical ‘brand’. And while Youssou’s many accomplishments can never be underestimated, his music remains somewhat atypical, more soigné than the ‘hard mbalax’ that packs Dakar’s dance floors weekend after weekend. Stripped of the sophisticated arrangements and catchy hooks of Youssou N’Dour’s cosmopolitan repertoire, ‘hard mbalax’ is a rawer music highlighting the relentless rhythms of the sabar drums, the tama and the ‘marimba’. One of my favorite ‘hard mbalax’ singers is also one of the founding members, along with Youssou N’Dour, of the Super Etoile de Dakar. Ouzin Ndiaye was born on June 20, 1953 in the city of Thies, which is located 60 km east of Dakar and is the junction of the Dakar, Bamako and St. Louis rail lines. His father Bame Ndiaye and his mother Mbouba Ndiaye were both Gawlo or Pulaar griots and Ouzin grew up to the sounds of his father’s hoddu (the Fulani lute). Ouzin joined his first music group, the ‘Diamono 1’, in 1973. Sponsored by the businessman Charles Diop and based in the Colobane neighborhood of Dakar, the ‘Diamono 1’ also included Ouzin’s second cousin Youssou N’Dour, who was only fourteen at the time, and an equally young Mbaye Dieye Faye (who would later become the Super Etoile’s percussionist). The group had a regular weekend gig at the ‘Lagem’ nightclub in Kaolack, a city located 170 km southeast of Dakar, but only stayed together for a year. When the ‘Diamono 1’ broke up, Youssou went to the ‘Etoile de Dakar’ and Ouzin joined the ‘Dagu Danu’, a group that was based in the Dakar suburb of Pikine. In 1977, after two years with the ‘Dagu Danu’, Ouzin moved to the ‘Super Xam Xam’, an orchestra then based in Guediawaye, another bustling Dakar suburb. And then two years after that, in 1979, Ouzin moved again, this time to the ‘Orchestre Takernassé’, a group that had a regular gig at the ‘Baobab’ nightclub, which was located in downtown Dakar at 10 Rue Macouda Ndiaye, in the shadow of the marché Kermel. All of these groups performed what Ouzin calls ‘la variété’, a mix of Cuban covers, interpretations of soul classics, and proto-mbalax. Then in 1979, Youssou asked Ouzin to leave the Takernassé and join him in the ‘Etoile de Dakar’, which had a regular gig at the ‘Jandeer’ nightclub, located on the western Corniche (the club still exists under the name ‘Le Kilimanjaro’). When, in 1981, Youssou decided to leave the Etoile de Dakar and start his own group, Ouzin followed and became one of the founding members of the Super Etoile de Dakar (along with guitar player Jimi Mbaye, and percussionists Assane Thiam and Mbaye Dieye Faye, who are all still in the group). Over the next ten years Youssou N’Dour and Le Super Etoile de Dakar would become Senegal’s most popular musical team. And although there may be more virtuosic guitar players in Senegal than Jimi Mbaye, or more creative percussionists than Mbaye Dieye Faye, there is no tighter band in Senegal, or in Africa I would argue, than the Super Etoile de Dakar. Without the Super Etoile behind him, Youssou would still be one of the continent’s greatest vocalists, but I doubt he would have had the extraordinary success that he has known over the last three decades. One of the reasons that the Super Etoile, unlike so many other groups throughout Africa, has stayed together so long is that individual members have always had the freedom to pursue solo projects. Over the years percussionists Assane Thiam and Mbaye Dieye Faye, bassist Habib Faye, and guitarist Jimi Mbaye have all released material under their own names. 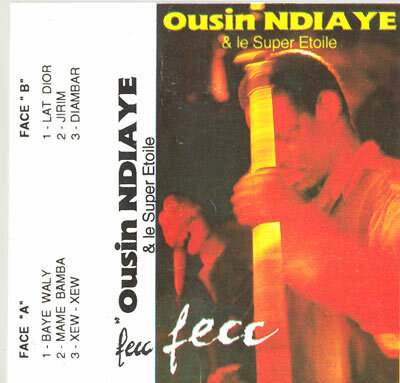 Ouzin Ndiaye has released five solo cassettes, four with the backing of the Super Etoile de Dakar, and one LP. He also, from 1973 to 1987, held down a day job as a civil servant at the E.N.A.M. (l’Ecole Nationale d’Administration et de Magistrature). Ouzin has a raw, gravelly voice that is in the same register as the great Wolof griots ‘Ndiaga M’baye’ or ‘Boucounta N’diaye’; a voice that if he were Cuban would be called ‘tipico’. One of the great joys of hearing the Super Etoile de Dakar perform back in the 1980s and 1990s was the beautiful contrast between Ouzin’s sandpapery vocals and Youssou’s high clear voice. I first saw the Super Etoile perform on a Friday night in early September of 1993 and it is an evening of music that I will never forget. I showed up at the Soumbedioune (one of the several incarnations of the Jandeer/Kilimanjaro) at around midnight and walked into an empty nightclub. About an hour and half later, most of the members of the Super Etoile ambled onto the stage and started to grease their musical gears with a series of jazz standards (think ‘Take Five’) and Cuban classics. Towards the end of one of these songs, the remaining percussionists walked onto the stage, took their places and started to knock their drums into shape. I was unprepared for what happened next. Mbaye Dieye Faye stepped up to his rack of Sabar drums, cocked his head to the right and ripped into the opening ‘bak’, the rhythmic call or introduction, to ‘Baye Waly’. 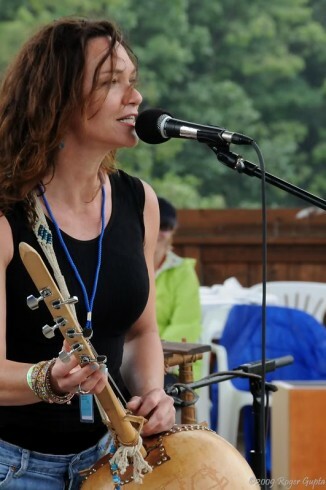 The keyboard marimba (the rhythmic ostinato that anchors the group) and the rhythm guitar fell into place, and then Ouzin stepped up to the microphone, kicking off three hours of vintage Super Etoile. (I can still picture Youssou leaning into the microphone during a slow version of ‘Diamono’ with the full moon, reflecting off the bay of Soumbedioune, shining through a small window behind the stage). ‘Baye Waly’ is Ouzin Ndiaye’s ‘morceau fetiche’ or ‘theme song’. The first version of this song was released in 1988 on Ouzin’s only lp, ‘Autorail’. He composed it for his good friend Waly Mody Ndiaye. Ouzin sings, ‘stand up. Waly Ndiaye, you are here in the room, answer me. Senegal thanks you. The citizens of Rufisque thank you,Waly Mody Ndiaye’. The cassette ‘Fecc’ was released in 1993 and is, I think, Ouzin’s strongest release. Like many other Senegalese artists, Ouzin has recorded several versions of his favorite compositions. 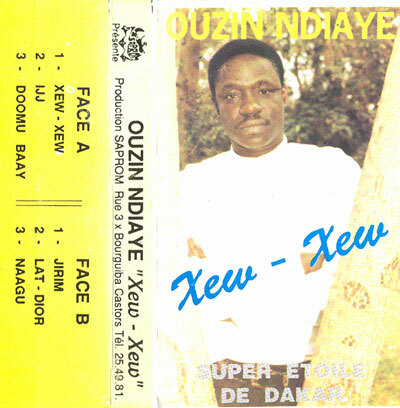 The song ‘Jirim’ first appeared on Ouzin’s cassette ‘Xew Xew’, released back in the mid 1980s. Ten years later Ouzin recorded this punchier version of the song. ‘Why are you crying?’ he asks. ‘The young orphan is crying. He has lost his mother and father. Don’t cry you are in God’s hands. If you believe, you must not cry. He is the creator and we all belong to him. We have to submit to his will. Orphan, you are in God’s hands. If he has taken your mother and your father, he will not abandon you. You will not be alone’. Ouzin released ‘Gao’, his first cassette, in the early 1980s: this cassette has been released with two different covers and under two different names, but Ouzin refers to it as ‘Gao’ (it has also appeared under the name Apollo). These are the only recordings that Ouzin has made without the Super Etoile de Dakar. The tracks were laid down at the old Studio 2000, which was located in a house owned by El Hadj Ibrahima Ndiaye in the Yoff neighborhood of Dakar, not far from the airport. Today, El Hadj Ndiaye owns a modern studio, performance space, and multimedia complex in the heart of downtown Dakar. Ouzin is accompanied by what was then the Studio 2000 ‘house band’, Cheikh Tidiane Tall on guitars, bass and keyboards, Abdul Aziz Dieng programming the drum machine and Midi synthesizers, Thio Mbaye on percussion, Robert Lahoud on rhythm guitar, and Cheikh Lo on backing vocals. ‘Apollo’ is Ouzin’s interpretation of the late 1960s Guinean song of the same name. He slips in the praises of a good friend, singing ‘your mother Ndeye Maguette Diagne, son-in-law of Aissa Agne, I sing for you’. ‘Xew-Xew’, released in 1986, is the first cassette Ouzin recorded with the backing of the Super Etoile. One of the best tracks on ‘Xew-Xew’ is ‘Doomi Baay’, another one of his original compositions that Ouzin has recorded several times; the first version was released on ‘Gao’. The title translates as ‘Father’s son’ and Ouzin sings, ‘we have the same blood, nothing should come between us. We have the same father, all that we are, we owe to our father’. Youssou joins Ouzin on backing vocals for the last several verses. This cassette also features the first version of ‘Jirim’, which Ouzin has recorded three times over the years. 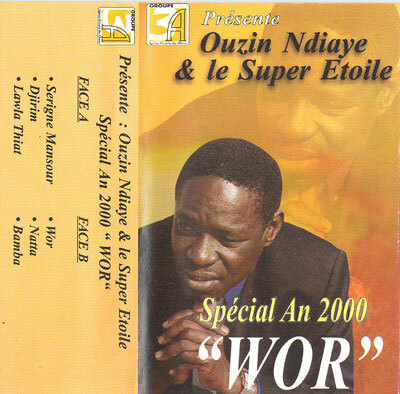 Ouzin’s fifth cassette is ‘Wor’, released in 2000, and again featuring the Super Etoile de Dakar. ‘Wor’ opens with a duo between Ouzin and Youssou N’Dour. In ‘Serigne Mansour’ they sing the praises of Serigne Mansour Sy, known as ‘Borom Daaraji’, who is the current Khalife of the branch of the Tijanniya Sufi brotherhood located in Tivaouane, Senegal. ‘Natta’ is a praise song that Ouzin recorded for his friend Natta Mbaye. He draws on the proverbs of Kocc Barma, a 17th century Wolof philosopher, to sing her glory. This track highlights many of the elements that make the Super Etoile such a great band, Jimi Mbaye’s melodic guitar leads, Pape Oumar Ngom’s unflagging rhythm guitar, Assane Thiam’s sharp Tama, Habib Faye’s tight bass playing and the solid rhythmic core laid down by Mbaye Dieye Faye on percussion. In recent years Ouzin Ndiaye has had some health problems that have forced him to curtail his appearances with the Super Etoile, but when we spoke several weeks he was looking forward to returning to the stage with the Super Etoile de Dakar. 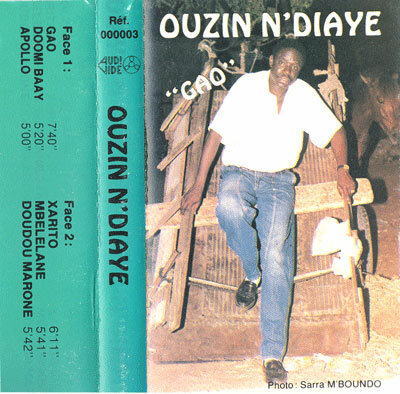 Ouzin’s fifth cassette is ‘Sama Yene’, released in 1997. I don’t have it, and am still trying to find a copy. Special thanks to Idriss Fall for his help with song translations! Very good idea a full article on Ouzine Ndiaye, I have only WOR but the tape was running a lot. As I read the work, really interesting I hardly knew anything, I’ve been picking the tracks without listening. I have poured into a folder and run as they have fallen … wow! They work as an album without changing the order. Thank you very much for this Hard Mbalak, have made me really enjoy. I never thought about the subject in the manner you do, it gives it all a new perspective that makes 1 wonder if there are more between heaven and earth that certain would believe, thanks for the enter and keep all of them comming, I will view and read each time for sure! I am glad to be a patron of this web blog! Great blog! I searched for a long theOuzin Ndiaye song titled “Serigne Mansour”. Finally I found it here. The occasion of my search is the passing the Marabout named Serigne Mansour 4 days ago.